Some may say that pizza is perfect just the way it is, no need for improvements. But it looks like Little Caesars would disagree. The fast food pizza purveyor is rolling out a new type of pizza like none you’ve tasted before, though the jury’s still out on whether that’s a good thing or not. The chain recently started testing a Lasagna Pizza that combines everything you love about lasagna, with everything you love about pizza. Sounds like the perfect carb hybrid, right? According to the company’s website, the frankenpizza is made with a toasted Parmesan- breadcrumb crust topped with “meaty” marinara sauce, Italian sausage, mozzarella, muenster, ricotta and, of course, mini ribbon pasta. Yes, they went there, and put noodles on top. It has 2,740 calories, 5,780mg of sodium, and 308g of carbs, so… uh… maybe don’t mention it to your doctor or trainer or, well, anyone for that matter. This pizza is certainly not for the faint of heart -- or the lactose intolerant -- but if you’re feeling up to the challenge, Little Caesars’ Lasagna Pizza is being served Hot-N-Ready from 4pm to 8pm at participating locations in Georgia, West Virginia, and Ohio. You can tackle this cheese and carb monstrosity for $9, according to a report by Chew Boom. 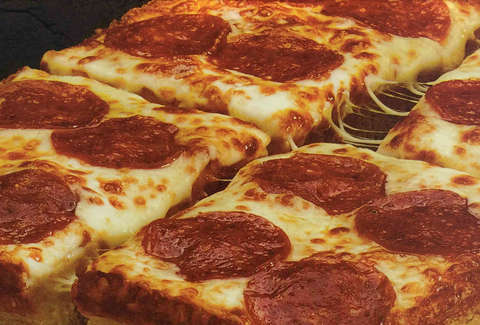 Little Caesars has yet to disclose whether the new Lasagna Pizza will be making its way to more cities, so you’ll just have to wait and see. And maybe preemptively go the gym forever.